I only got 1000 words written yesterday. I’m disappointed, but as Jason over at The Victorious Writer has reminded me, the simple act of writing is enough, and to not get bogged down with notions of failure. 1000 words was all I did yesterday then so be it.Writing any amount is still writing. This chapter immediately follows the second chapter. Please excuse the weirdness with tense. The child would turn thirteen in less than a month. She lay on a soft bed of kelp, without a care in the world. They had come to see a new Light of Joy take her place as protector of the Sunken City. The child looked up as the arch filled with more and more of her people. 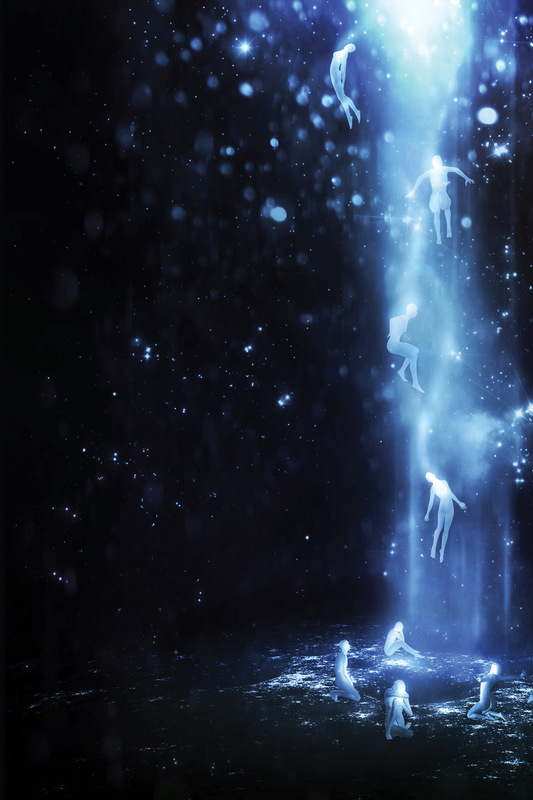 It was filled to the top, with people floating, facing the fading Light of Joy. The child nodded, and held out her translucent hand to her father. “Are you certain this is the right time for this?” her mother asked her father. The mother nodded and they swam away from the ceremony that took place every five years when the Sun, Moon and Sunken City achieved some alignment that only the Dons knew of. The secrets of the ceremony was passed down to each Joy as she trained to become the next Light. The child followed dutifully as her parents swam to the Protectorate’s central complex. No one could mistake the gleaming spire for anything other than the seat of power in the Sunken City. The family skirted arches and swam along grand staircases, shrinking the distance between them and the base of the tower. The child made note of the stairs as they were replaced by a flat expanse of stones. Intellectually, she knew what stairs were for, but only those unbalanced in some way actually placed their feet on them. The Shield’s nictitating membrane slid aside so he focus his eyes unencumbered on the woman and the rest of her family. Only a family member, or those with a personal relationship would mention the Don by her name. To do otherwise was strictly taboo – their society was focused on jobs, and individuality was frowned upon. Each job had its own particularities, but championing those differences was simply not done. But, a Shield’s job was to protect the citizens, even if it meant protecting them from themselves. He would rather die than allow acces to the Don without her prior approval. The Shield looked up along the tallest spire in the Sunken City. He closed his eyes and swayed with the tide slightly. After a few moments, his eyes opened, and he stood aside to allow the family admittance. A woman the parents recognized, but the girl did not, descended from tower walls that disappeared above them. The immense structure was rumored to have existed before the Great Collapse. The child imagined a time when the spire walls were exposed to air instead of water. She dismissed the notion as a flight of fancy for a child several years younger than she. The woman had hair growing from the top of her head and it billowed as she came closer. It waved as kelp did in the fields, but it was finer, and beautiful, the child thought as the woman slowed her decent. Her father subconsciously rubbed his hand down the back of his naked head and rested it behind his neck gills. As the woman gathered her tendrils of unkempt hair, the trio noticed her skin was a rich bronze. “Except the Light of Joy,” the woman said as she floated just above the floor in front of the family. “Healer,” she spoke to the mother, touching their foreheads together. “Artisan,” she repeated the ritual with the father. “Child,” she spoke to the youngest of the group last, as was tradition, but she did not touch her forehead the little girl. The Child’s eyes focused on the woman with the strange skin and hair, and wondered at the breach of protocol. Failing to greet the entire family as was customary was an egregious slight, but as the youngest, it was not the Child’s place to initiate the ritual. “It is time,” the woman said as she closed her eyes. There was a disturbance in the Sunken City. The voices, normally a cacophony of sound and feelings were suddenly silent. They could feel it happening. They knew the procedure, and the little girl had even seen it five months ago. The new Light of Joy would touch the old crystalline Joy, and the transformation would take place instantly. The new Light of Joy would shine brilliantly, and the entire city would bask in the increased heat and brilliance. The child remembered watching the old Joy slowly float up, as she granted her power. Healers would swim and retrieve the body of Joy and whisk her away to the central complex, all in attendance would avert their eyes out of respect. All but the little girl – she watched the faded Joy as the procession moved by her vantage point. “And that is why you will be the next Light of Joy,” the woman replied to the little girl’s hasty memory. Realization splashed across the girl’s face. The Don not greeting her suddenly made sense. It was not a slight of some unknown sin, but a gesture of respect. The gravity of the situation pressed against the child. She new what was expected of her, but still she hesitated. She could refuse. She looked first to her mother, then to her father. She didn’t need for them to say anything. They shared a look of immense pride in their offspring. Their daughter would protect the Sunken City. The girl nodded, and floated to the Don. What was her name? Vess, she heard as she pressed her forehead to the strange woman’s. “Don,” she greeted, accepting her role as the future Light of Joy. This entry was posted on Sunday, June 21st, 2015 at 09:00	and tagged with newYAproject and posted in fiction. You can follow any responses to this entry through the RSS 2.0 feed. Thanks Kate. I’ll post part four in a few hours.